An intuitive, powerful, comprehensive learning management system designed for health science programs. eduCATE is the first modern learning management system designed to satisfy the unique needs of health science programs. The ability to manage courses, student's didactic performance, and more through a comprehensive application is critical to maintaining programs of all sizes. Designed with a modern look and with usability as a focus, eduCATE is able to meet the specific needs of health science programs. Through this application, eMedley’s existing management, scheduling, and curriculum tools are integrated into one comprehensive and intuitive system. eduCATE allows instructors to do everything from creating online discussions to administering high stakes exams. 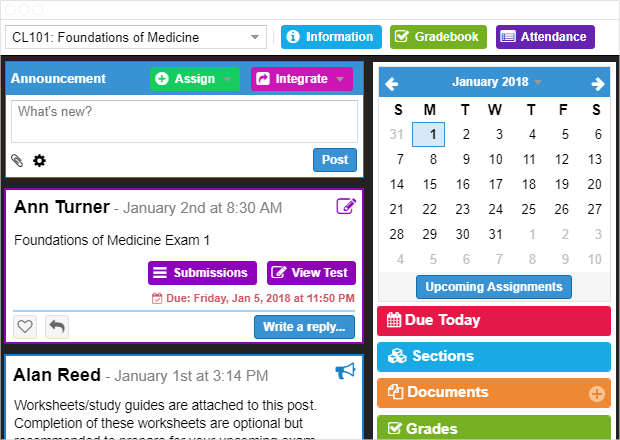 Course content is delivered to students in a familiar feed-style with all homework, quizzes, and posts in one place. Create new course content with a single click. Easily look at an overview of all courses, from uploaded documents to homework, announcements, and quizzes. With evaluation, test, and homework scores for each student all in one place, maintaining student data is fast and intuitive. Track daily course attendance. Report on attendance percentages over time. Use specialized assignment types like announcements, polls, and more to customize every course. Keep students up-to-date and on schedule with the calendar that displays upcoming assignment deadlines. Engage students in course material by creating, moderating, and participating in discussions. Assign custom grade scales of any type to courses. Grade criteria can be customized by percent or type ranging from A-F to Pass/Fail. Answer student questions quickly through in-application messaging or send messages to individuals or custom-defined groups. Grade homework assignments quickly and easily using custom integrated rubrics. Align quiz or test questions to your institution's standards to ensure student competency. Take full control of student grades by setting curves for assignments, setting grade adjustments, and manually overriding student grades. Use built-in discussion boards or integrate Google tools like Docs, Sheets, and Slides for collaborative assignments and projects. Use eduCATE with other eMedley applications or external LTI-standard applications to easily integrate your LMS with existing systems. Students can use the eduCATE mobile app to check grades, communicate with instructors and peers, and stay up to date with course content. Give updates, attach files, assign tasks, talk about your weekend, remind students of due dates – create announcements chock full of features and extremely easy to post. Attach relevant files, videos, or images for students to complete and turn in all in one place, with immediate feedback. Create and assign simple quizzes using an easy to use quiz builder. Randomize the order of questions and answers, reuse and copy questions from other quizzes, allow students to get instant feedback on submissions, and more using a wide array of customization options. With the checkbox, dropdown list, and radio button poll types, gathering data and feedback on opinions is only a click away, eliminating the need for external platforms. Schedule and attend cross-platform online meetings so you can communicate and collaborate regardless of location. Post discussion topics or links to relevant papers and videos for your students to respond to and learn from collaboratively. Have it graded or ungraded. Directly from your feed, assign exams and quizzes with adjustable options such as the test-taking window, time limits, and much more. Once results are in, it only takes one click to import scores into the Gradebook. Configure relevant evaluations from eValuate to display directly to students' feeds, making it easier to fill out and increasing response rates. Connect posts, documents, and assignments to a specific lecture or lab from eCurriculum. Your Gradebook contains evaluation, test, homework, and discussion scores for students. Instant feedback allows you to see student submissions and scores as soon as they come in, and weighting scores makes grading a breeze. Additional functionality to assign graders for assignments and easily curve and re-scale grades is also available. Integrate eduCATE with apps that comply with the LTI standard. Choose to share interesting content with others directly from your feed by posting links, videos, and more to social media timelines. Communicate directly with individual or groups of students through cross-platform direct messaging on desktop or mobile. Get an overview of performance across students, faculty, and sections. Dashboards compile statistics and create data visualizations for assignments, posts, submissions, and grades making it easy to see performance. Keep students up-to-date and on schedule with the ecurriculum-integrated calendar that not only displays upcoming events or deadlines but provides reminders as well.